We love the holidays, because we get to be part of your very special product orders for customers and loved ones. 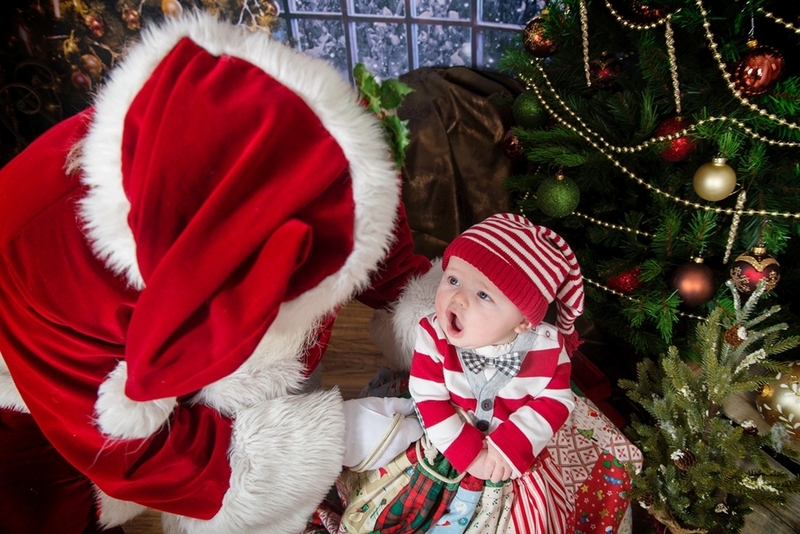 We enjoy seeing the special moments you have captured for your clients that they will treasure forever. We take pride in providing quality of products, customer service and collaboration that makes us more than just a lab. We appreciate you and thank you for trusting us with your business! With Christmas quickly approaching, we want to let you know our products will continue to be produced and shipped in our normal service times throughout the holiday season. Click the button below to review the few product cutoffs that require earlier submission in order to receive by Christmas as well as our lab holiday schedule. Our new ornament features a handmade wood base with an attached metal print. Natural twine, silver beads, and a “2018” charm finish off this one-of-a-kind gift. 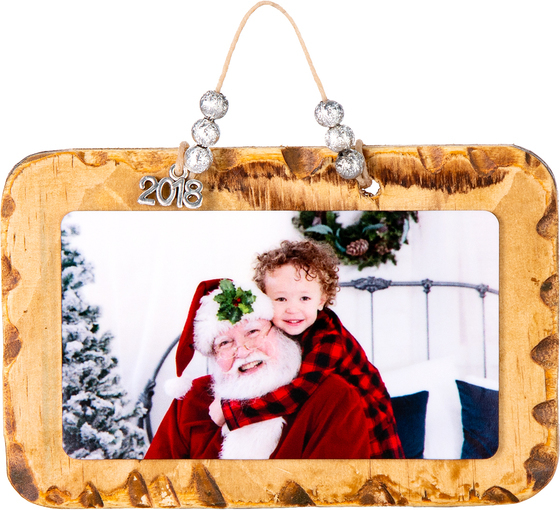 Enjoy the natural beauty of this unique wood ornament, combined with excellent image quality on the brilliant-finish metal print. This keepsake, limited edition ornament will be something customers will treasure! This is also a great customer appreciation gift for those special customers you want to say “thank you” to during the holiday season. Because each vintage wood ornament is made by hand, no two will be exactly alike. new thicker paper for press cards! You have been asking, and we have listened. We have updated our 110# card stock to 130# for all cards using Pearl, Linen, Art Matte and Recycled papers. You will love this NEW thicker, heavier paper for our press cards – just in time for the holidays! 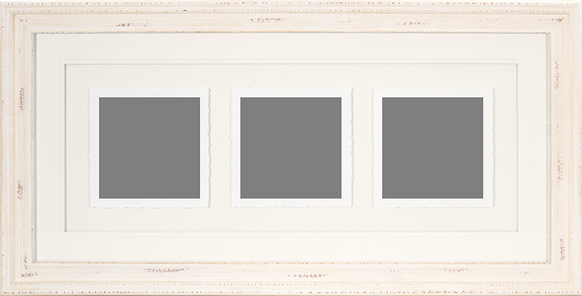 Four new frame styles have been added to our Torn Edge Trios (shown below), which can be used horizontally or vertically. 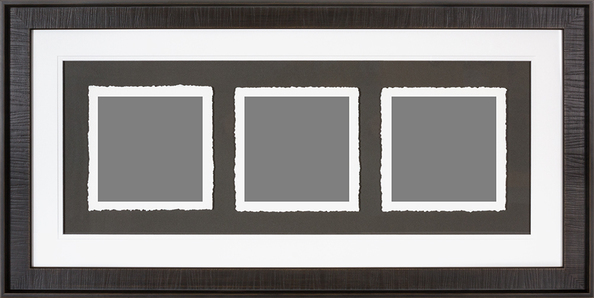 Start with your image, combine it with our beautiful fine art watercolor paper with hand-torn edges, and complete it with float framing! 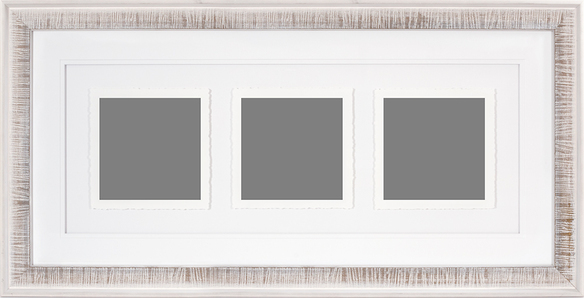 This product comes complete with the fine art torn edge print, floated-print feature, double mat and glass – printed, framed and ready to hang! 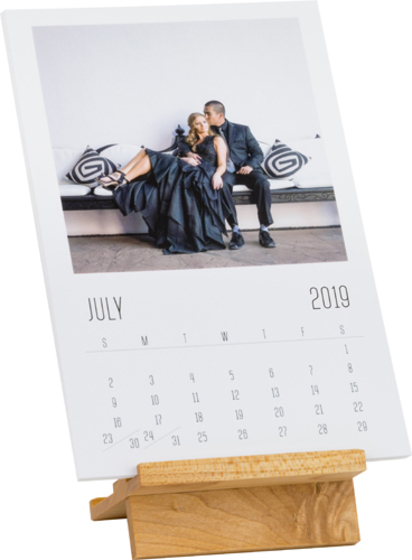 Our fun desktop wood easel calendar is the perfect, budget-friendly customer gift for the holidays! Choose from four themes, horizontal or vertical format. Calendars are printed on your choice of one of our beautiful press papers. 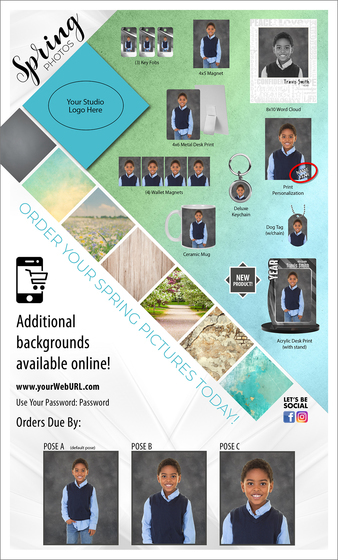 Use this product as an add-on sale to your family portrait and wedding packages, or as a great way to tell your customers thank you for their business! Send your customers an unexpected gift this Christmas, and they will remember the personal care and attention you offer for years to come! Some fun, easy products to offer as gifts to your customers (or ideas for your customers to purchase as gifts) include our accordion minis – the perfect way to feature favorite extra images from the shoot. Other great options include our new, special edition Vintage Wood Ornament, our Desktop Wood Easel Calendar, Metal Ornamentsas well as Framed Canvas Gallery Wraps, Curved Metal Prints and Leather Wrap Mini Albums! Another option would be gifting a special jewelry piece. We have so many jewelry pieces to choose from. Enjoy shopping and happy holidays from our families to yours! When ordering framed prints, it can be quite the math problem to figure out the final outer dimension of the finished piece. Not any more! We are providing an Excel calculator to help make this much easier. 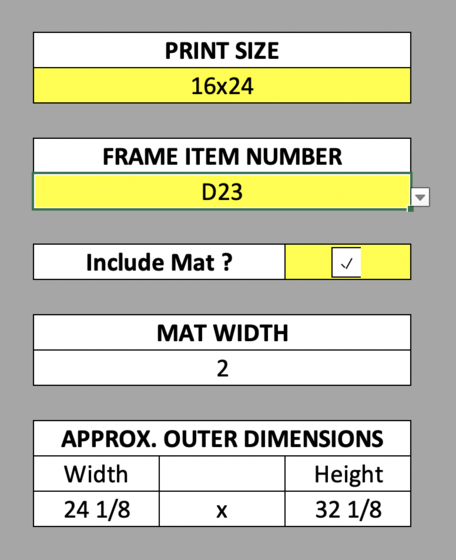 Select just three things (highlighted in yellow); the print size, the frame style, and whether or not you would like a mat included. Let Excel do the rest! As of December 31st, eZsuite orders will not longer be accepted for processing. Download our current hhstudio software from our website. If you have any questions, please contact our customer service team. You may have heard, we have some pretty amazing new album and book design software! It’s called Velocity and you will want to take a few minutes to check it out-because it will save you HOURS of time and hassle. Design and upload your orders directly to H&H using Velocity. Best yet, it’s free for all H&H customers! Learn how to use Velocity – everything you need in one place! 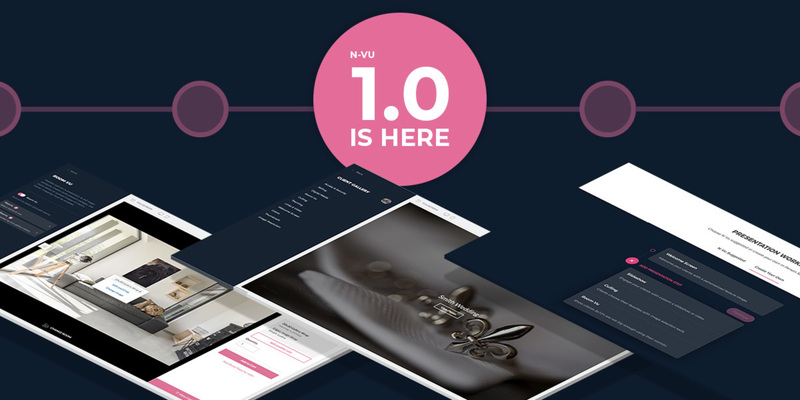 Visit our new Velocity Tutorial page to learn step by step how to use our new album and book design software. 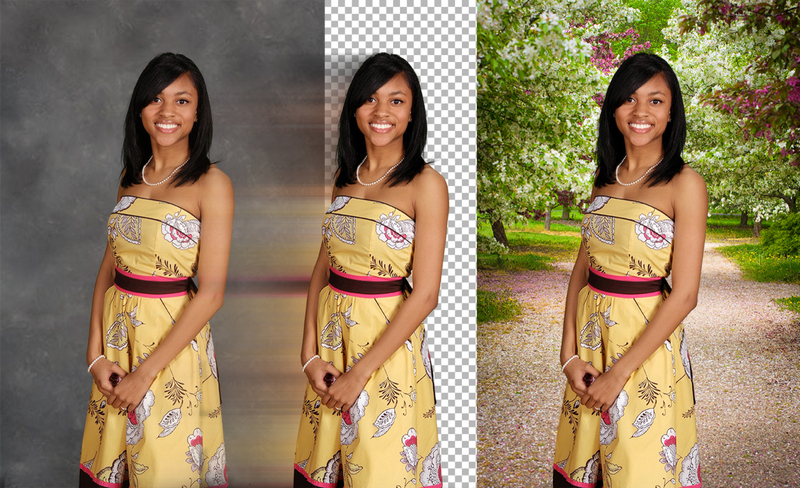 Masters Extraction background knockout is now available! Testing for the new service begins December 15th! Masters proof plan flyer customization available January 1st through our design center! You can now create unique and competitive sports banners without spending hours in Photoshop. No more knocking out your own images, creating graphic banner designs, personalizing each design with the team colors, and making unique files for every player with their names and other stats? Simply photograph each player, pick your design, and order the banners. It’s really that easy! CD delivery is still available but we expect most studios will choose the new Web delivery option. H&H is honored to be a sponsor for the “Portraits Americana” exhibit. For this exhibition, Guest Curator, Glenn Rand has chosen works that will show how American artists used and are still using the photographic portrait to bring a greater understanding of the subjects, settings, personalities and the artists’ vision. This exhibition is about American artists producing portraits since the turn of the 20th Century. It provides insights into the way these artists used various tools and approaches to reach the essence of their subjects with the common theme from the perspective of art.